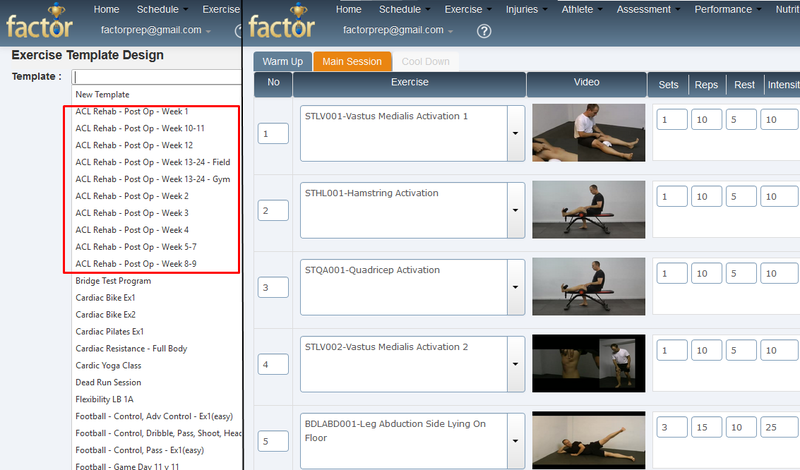 ​factor athletic preparation software is the most complete Strength & Conditioning platform available. It encompasses Annual Plans, Exercise Programming, Training Loads (proposed and actual), Injury and Treatment Tracking, Recovery Testing, Performance Testing, Assessment Testing, all with incredible analytics. The platform has taken over 10 years to create and is created by Adrian Brough a strength and conditioning coach with more than 20 years hands on experience and he is still actively training today. Adrian has worked with professional, amateur and disabled athletes in many different sports including many years rehabilitating athletes playing the toughest sport in the world, Rugby League and he has produced some outstanding results. Adrian has integrated his years of knowledge and experience to produce a complete strength & conditioning platform. This platform has been described as "The most complete well put together strength and conditioning software I have ever seen" and "Amazing and how exciting that our industry now has a fantastic tool for training athletes" by some elite level strength & conditioning coaches. factor platform can be seemlessly integrated into your club and customized to your specific requirements to ease your workload and improve your results. ​The seasonal planner is a simple to use tool that provides an incredible amount of potential to the coaches. It is has the ability to build the most amazingly detailed seasonal training plan or use it to simply hold some planning notes. The assessment tests section has many modules aimed at assessing an athlete's ability to recover from training and competition and the likelihood of injury. ​fact﻿﻿﻿or has a large list of performance tests for speed, agility, strength, power and fitness. The entry of a test result receives immediate feedback on the athlete´s result relative to their previous best result, with associated data. We have created an Exercise Log that has well over 3000 exercise videos of all variations. The videos play faster than YouTube videos and play in our mobile application. There is also the capacity to add your own exercise videos. Adrian Brough is one of the world´s best physical preparation experts based on the results he has achieved during his more than 20 years of experience in this field. ​The world´s most complete and easy to use athletic preparation program. factor﻿﻿ will provide the most detailed analysis and development of training programs and competitions available. And many more things. As we suggested, we used Dylan Warner´s recommendations from his recent research paper and our over 20 years experience in working with and rehabilitating elite athletes and created an advanced 24 week post-op ACL rehab program. We have created 22 exercise programs that gradually progress from week 1 through to week 24. We have included alot of activation and stability exercises along with some great progressions for loading the joint as a progression into full weight bearing running. We have also included exercises to help prevent the injury from happening again. And as with all Factor exercise programs, it is easy to change if required and super easy to assign to the athlete. We also created a rehab program to allow an athlete to do the rehab from home. Here at factorprep.com we have just finished entering the full ACL (anterior cruciate ligament) post-op rehabilitation program from Dylan Warner´s new research paper. So, now when using the Factor platform, you can assign a research backed ACL rehabilitation program to an athlete within seconds and track everything. Coming soon - we will combine Dylan´s research and our years of experience to create a Factor ACL rehab program and we will also be entering a researched back Osteitis Pubis Rehab program. factor did it again as our performance department in conjunction with the use of the factor platform produced an incredible rehab of a young 15 year old professional football/soccer player from our live-in program after he suffered a Jones fracture while training with his team. His first 3 weeks were spent in an immobilization boot as ordered by the doctor. Following those 3 weeks and due to alot of smart rehab work that we accomplished during those 3 weeks we were able to have him return to full training only 2 weeks later. From start to finish 5 weeks and judge for yourself if we have done a good job by watching the video. After our rehab, he was 30% stronger in the upper body, 20% stronger in the lower body and appeared to be running faster as well. However we didn´t test the running so that is our subjective opinion. What an impressive rehab. Alex was a 23yo professional rugby league player who had been playing several seasons with a groin injury. He had numerous medical and S&C teams work on his groin injury but no-one was able to fix the problem which had progressively gotten worse. The pain was so severe it was preventing him from training and playing rugby league. He was at a point where he could not get a contract with any first division or second division teams. Eventually, he was given a lifeline by coach Rohan Smith in second division team Bradford Bulls. Rohan signed Alex in the hope that Factor S&C software team of Adrian & Shane along with club physio Amy Kirkbride could firstly, fix his injury and secondly, rehabilitate him to play professional rugby league again. What was to follow was probably the most intricate and flawless rehabilitation I have been involved in. Without any surgical intervention Alex was initially fully rehabilitated to full painfree function followed by rehabilitation to return to full play. Alex was then signed with a first division team where he became a starting player and went on to win the minor premiership and going on to the Grand Final. Alex played the entire season without injury and scored the teams only try in the grand final. From career ending injury to first division grand finalists within one season. Some absolutely outstanding work by the Factor team and Amy and credit to Alex for his commitment and professionalism. Adrian Brough the founder and creator of factor S&C software does it again. Adrian was engaged to help an English professional rugby league team who were languishing in 6th position on the table with massive injury problems. Adrian arrived with 5 games remaining in the home and away season with the team having 10 of their 30 player squad in rehabilitation and 18 players having groin pain on the adductor squeeze test. Within 3 weeks Adrian had the groin pain on squeeze down to one player and all players but 2 back in full training. The team went on to complete the season winning the Championship Shield which was the clubs first silverware in 10 years and the players affectionately named Adrian, The Wizard. Ability to customize the schedule. Add custom sessions and custom groupings. These can be added in seconds. Copy & Paste sessions in the schedule. Easily copy & paste sessions complete with athlete allocation and exercise programs in seconds. Simplicity of planning sessions in the schedule with the ability to add athletes later when necessary. Physiotherapy Assessments. We have added a page of very useful physiotherapy style assessment tests to help evaluate an athletes likelihood of injury. These along with the factor view grids makes it very easy to assess whether an athlete is progressing or regressing in relation to the injury risk. Added more bridging exercises including, long lever, straight leg, single leg and more.